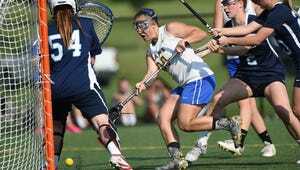 In the hours after the Kennard-Dale girls' lacrosse team slayed the District 3 dragon that had been Manheim Township in a semifinal Tuesday, the Rams' focus turned to 5 p.m. Thursday when they'll take on No. 5-seeded Exeter Township in the district championship game at Hersheypark Stadium. The Rams had reached the semifinals four times in the last seven years, but had only advanced to the title game once — a 14-10 loss to Manheim Township at Hersheypark Stadium in 2013 — before beating the Blue Streaks, 17-15, on Tuesday. The win snapped Township's 30-game win streak in the district playoffs and opened the door for a York County team to win its first District 3 lacrosse title. It marked the first time a team had defeated Manheim Township in the district tournament. Now can Kennard-Dale bring the title home? Well the Rams' confidence should be sky high and other than a midseason overtime loss to York Catholic, their resume is clean. Emmie Dressel and Clare Boone will be two key players on Thursday. Dressel, a junior attacker, scored five goals and added four assists against Manheim Township. Just as she has for the majority of the season, she looked like the most dominating, confident player on the field. And the Rams will need another big performance from her against Exeter. Boone, only a sophomore, has been among the top three goaltenders in the YAIAA all season. She made six saves against the Blue Streaks, and she'll have her hands full against Exeter's attack. Four different Eagles scored multiple goals in their semifinal win over No. 1-seeded York Catholic, including Lexi Einsig, who scored the game-winner in double overtime. Exeter's speed has presented problems for opponents, York Catholic head coach Rob Linthicum said as much afterward. So the Rams' defense will need to be alert and aware of Exeter's attackers. The Eagles come from the Berks League. They never reached the district semis until they ran through Cumberland Valley and Wilson in first round and quarterfinals this year. Then they erased a three-goal deficit late and knocked out No. 1 York Catholic, 10-9. They had the fifth-best defense in the district, so they'll try to slow the game down against Kennard-Dale like they did against York Catholic. Their transition game is fast, and their attackers can blow by defenders. So they can be a challenging team to defend, Linthicum added. Regardless of the outcome, both teams will represent District 3 in the state tournament. And one team is leaving Hersheypark Stadium with their first district title on Thursday. "I'm very happy, especially for our seniors," Rams head coach Kelly Wetzel said. "This is the third time in four years for them (to qualify for the PIAA tournament). I'm very pleased with them and happy for them. And they should be proud of everything they've accomplished this year." Follow along: Get live, multimedia updates on the action at GameTimePA.com.